Hardcover UK, first printing and true first edition. Very fine (unread) copy in very fine jacket. Signed by contributor Michael Moorcock at his story "Firing the Cathedral" on the Contents page. 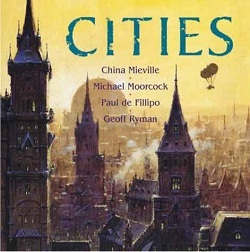 Omnibus edition that collects short stories by China Mieville, Michael Moorcock, Paul di Filippo and Geoff Ryman previously published only in limited edition novellas by speciality publisher PS Publishing. Edited and introduced by Peter Crowther. Excellent full color, wrap-around dustjacket illustration by Edward Miller.